Recently I received a question asking about inserting math symbols, expressions, and equations into Google Forms for quizzes. 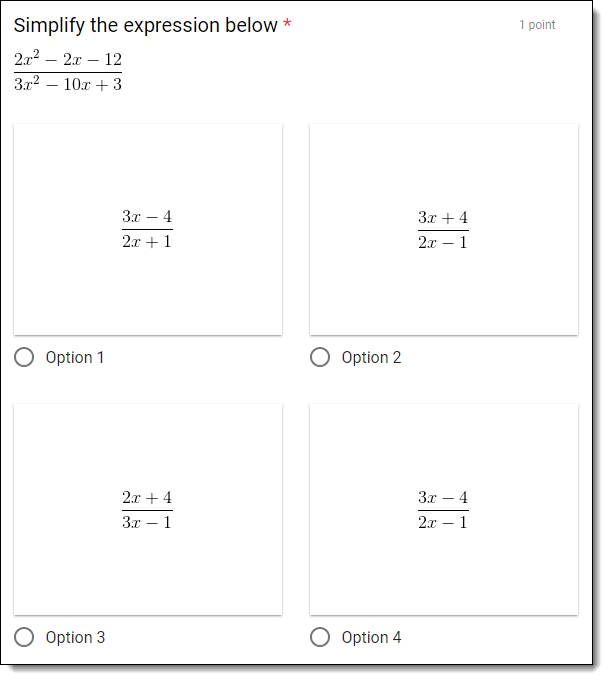 In the past I have blogged about the Equatio extension for this purpose, but the educator was looking for a no cost solution. As a previous math teacher, I am very sympathetic to the need for easier ways to represent math digitally. I also totally understand the financial constraints schools deal with, as I have worked in and with districts facing the same budget concerns. In the end I think I came up with a solution that meets all of those requirements. 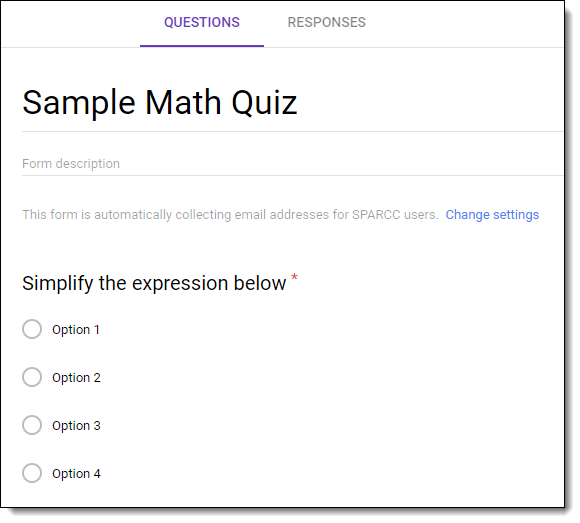 With this process, teachers can quickly, easily, and freely add mathematical (and scientific) symbols, expressions, and equations to Google Forms for quizzes they are creating. See below for a video and written explanation of the tools and steps needed for this. In a later post to follow, I will address the flip side and cover how students can submit mathematical expressions for answers in a quiz. 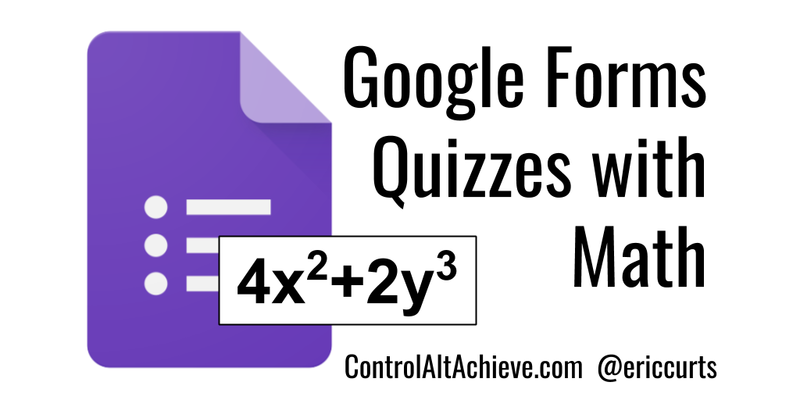 For this post though, we will just cover the first part explaining how teachers can make Google Form quizzes with math expressions. For this example, we will just do this one problem, but you could repeat the process as much as needed to make more questions for a longer quiz. To begin, create your Google Form as normal, turn on the quiz settings, and type in your first question with as much as you can do with just regular text. 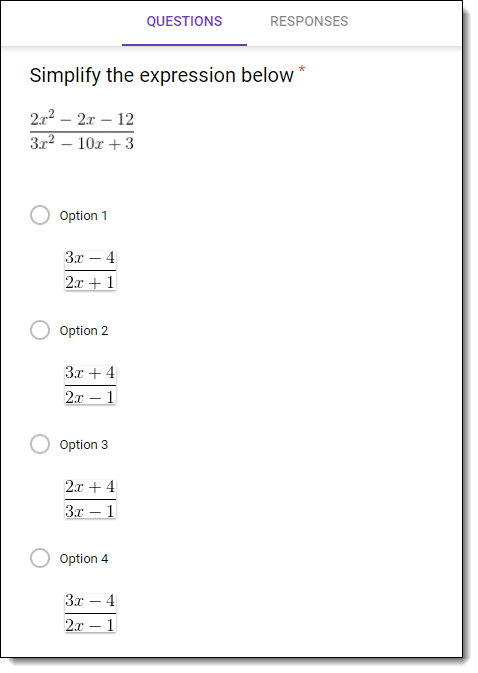 Google Forms only allows us to type in plain text, so to add math symbols and expressions, we need to insert those as images. For our next step we will do that to add the math expressions for the question and for the four possible answers. 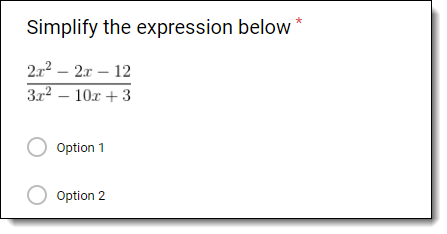 For this step we need a tool that will let us make math expressions as images, which we can then insert into our Google Form. There are many ways this could be done, with many different tools. However, the option we will be using here is a web tool called CodeCogs. Type in the equation box and use the menu buttons to insert symbols and format our expression. If needed we can adjust the font size, style, and even color. When done we should have the expression needed for our quiz question. First, click on the "Add Image" button to the right of our quiz question. This will open the "Insert Image" window. Click on the tab titled "By URL" to select that option. Now from the CodeCogs window, click and hold down on the image of your math expression. With the mouse held down on the image, simply drag and drop the image onto the box in Google Forms that is labeled "Paste an image URL here". Just by dragging the image onto that box, it will automatically paste in the needed URL and the image will appear below. Now simply click the "Select" button and the image will be inserted into your Google Form quiz. 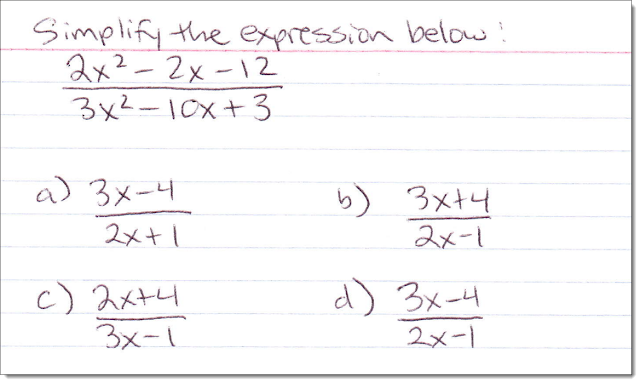 From here on out you can just repeat this process to quickly and easily create the other math expressions you need for the answer choices, or for other questions. Then drag and drop the images onto the "By URL" tab of the "Insert Image" window to add them to your quiz. Of course, don't forget to set the answer key with the correct answer and point value, as you would with any normal quiz. As technology progresses, I am convinced it will continue to get easier and more natural to express math and science content in all our work. For now we still need to be a little bit creative to find tools and tricks to help bridge that gap. 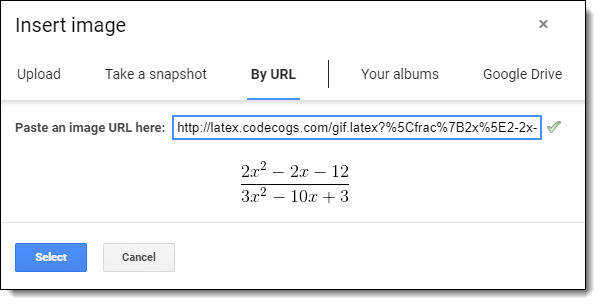 For now, one of the quickest and easiest ways I have found to add math and science expressions to a Google Form quiz is to drag and drop images create with the CodeCogs web tool. Hopefully you as well will find this to be a time saver for your work. If you have other suggestions, please share your tips in the comments below. In a future blog post, we will revisit this issue from the student perspective, and will explore how students can create and submit math expressions when they are completing a Google Form quiz. I'm going to have some pretty excited math teachers at my school. Big thanks for this! Nice resource, I usually perform my quizzes in a Google Doc and I ask them to use the built-in equation editor to show their work for full marks.